Learn How To Make A Beaded Bracelet. You can learn how to make a beaded bracelet or anklet with these simple instructions. Most wrist bracelets are approzimately 7 inches but you can make any length you want. If you want to make an anklet add 2 to 3 inches to the length. It is best to measure your ankle. Some people like to wear the anklet below their ankle bone. Other people like to wear it above their ankle bone. It is all up to you. The first step to make a beaded bracelet is to cut your wire. I use a 21 strand wire like Beadalon or Soft Flex. They are both good wires for making jewelry. Allow enough wire for the length of the bracelet plus I always add about 4 inches. This gives you enough room to work with. It is very upsetting when you get to the end and find you don’t have enough wire left to finish. Choose The Beads For Your Bracelet. 1. You can make it all one size but it has more character if you vary sizes. Choose spacer beads for in between your larger beads. 2. Choose findings for your beaded bracelet. You will need a clasp and two crimp beads. 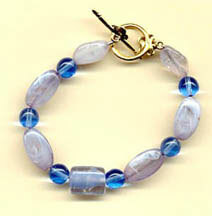 The crimp beads are used to secure the ends of your wire on your clasp. 3. You can get a beading board but for now you can just lay out your beads on a towel on a flat work surface. Lay out your beads in the design that you want. A little planning now will save you a lot of frustration later. 4. Place a crimp bead on your wire and then add one end of you clasp. Give yourself about 1/2” of wire and then thread it back through the crimp bead. Now crimp the bead and you have attached the first part of the clasp. You really need a crimping tool (they are not very expensive). 5. Start threading on your beads until you have the length that you want. Wrap it around your wrist to make sure it is long enough. 6. When you have determined that it is long enough, put another crimp bead on and then your other end of your clasp. Thread the wire back through the crimp bead and crimp it. 7. Be sure to pull on the clasp to make sure that the crimp bead is tight enough. Cut off your excess wire and you now know how to make beaded bracelet.